This spacious top-load washer from Maytag features 11 wash cycle options with 5 temperature selections and 3 soil selections, so no matter what you're washing, there's a perfect cycle for it. With the Deep Water Wash option, you get added fight against stains and other messes. Deep Water Wash fills the wash basket with a maximum water level. Available on any cycle, the extra water works with the PowerWash agitator to effectively break up and rinse away crusted-on messes. Fight everyday stubborn stains with the Auto Sensing option, which adjusts the water level for each load to provide efficient, concentrated cleaning. Enjoy a spacious top-load washer that ensures the ultimate clean for every load with this powerful selection from Maytag. 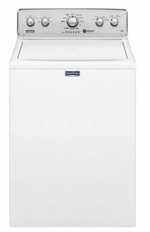 Move mountains of laundry with extra-large 4.2 cu. ft. capacity. Bulky/Sheets, Clean Washer, Cold Wash, Drain & Spin, Hand Wash, Normal, Powerwash, Rinse & Spin, Soak, Whites, Wrinkle Control. For more water when you want it, choose the Deep Water Wash option to fill the wash basket with a maximum water level. Available on any cycle, the extra water works with the PowerWash agitator to effectively break up and rinse away crusted-on messes. Fight everyday stubborn stains with the Auto Sensing option, which adjusts the water level for each load to provide efficient, concentrated cleaning. Thoroughly clean clothes and rinse away excess detergent and fabric softener with the Deep Rinse option. Four extra rinse options, both with or without fabric softener, ensure the ultimate clean for every load. Consult product installation guide for exact dimensions. 1 Year Limited - Parts and Labor.